The pulp's most murderous crime buster wages his deadly war on crime in two violent 1935 thrillers by Norvell Page. Recovering from life-threatening injuries, Richard Wentworth confronts the lightning-wielding Lion Man from Mars to end mass slaughter and save his beloved city from "The Flame Master." 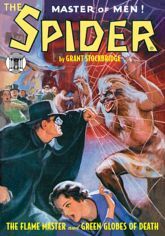 Then, with Nita held hostage and Commissioner Kirkpatrick enslaved by a criminal mastermind, The Spider wages war against the acid-spraying "Overlord of the Damned." This double novel pulp reprint showcases the original color covers by John Newton Howitt, classic interior illustrations by John Fleming Gould, and historical commentary by Will Murray.